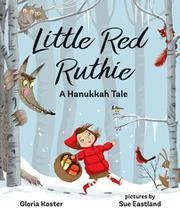 A Hanukkah culinary delight saves Little Red Riding Hood’s literary, Jewish cousin. Winter chills cannot keep Ruthie from her Hanukkah visit to Bubbe Basha’s house to cook latkes. She dons her red-hooded puff jacket, fills her basket with the perfect culinary accompaniments—sour cream and applesauce—and sets out through the forest for her grandmother’s house. To no one’s surprise, except hers, she walks straight into a wolf who is hungry for Ruthie. Determined to be as brave as the Maccabees, Ruthie proceeds to talk her way out of the wolf’s mouth. If he gives her just eight days, (as long as Hanukkah lasts), her skinny white self will fill out. The wolf cannot wait and sets out for Bubbe’s house. She is not home, but the wolf entertains himself by dressing up in her fancy clothing. When Ruthie arrives, she is able to read the note on the door (which the wolf could not), saying that Bubbe will return soon. Alone with the wolf, Ruthie combines frying the latkes with telling the impatient predator the story of the holiday. Eating so many fried potatoes, even if delicious, deters the wolf from his original scheme. Digital art, with red predominating, is an entertaining accompaniment.